Media captionOdette has been waiting for a kidney and pancreas transplant for a year. In an attempt to make more organs available for transplant, ministers are proposing a radical change by moving to a system of "presumed consent". Current rules in England mean those willing to donate their organs, should they die, sign up to a donor register. A consultation on the new system, which would see opting out of organ donation replacing opting in, starts on Tuesday. Wales has already adopted an approach of presumed consent. Scotland plans to introduce a similar scheme. Northern Ireland has also expressed an interest in doing likewise. About 6,500 people in the UK are waiting for an organ transplant. Every year, 450 of those on the waiting list die before the right donor is found. Emma was diagnosed with type-1 diabetes as a child. After nearly 30 years, the condition has wrecked her kidneys. 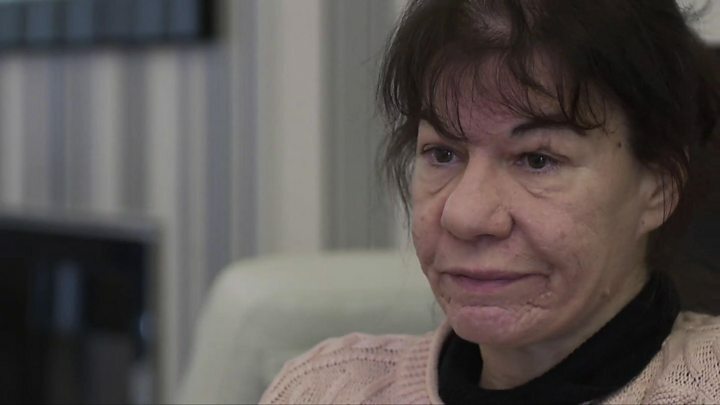 Every night Emma plugs herself in to a dialysis machine, and then nearly two litres (3.5 pints) of fluid is pumped in and out of her body, doing the job of her damaged organs. "Everything I do is the dialysis and medical," she says. "You get up, you come home and then you sit on a machine. "I don't do anything else, I don't enjoy life, I don't have a hobby, nothing... so that's all I do." With a young daughter, Emma relies a lot on her husband and family. And she still manages to hold down an office job. But, she says: "You're tired all the time as it is, and it's like how much of this can I take, how much can you take being tired all the time? "You want to do stuff - you need to do stuff - but where do you get the energy to do it? Where do I find that energy?" It is still too early to say what impact the change in Wales has had, but so far about 205,000 people have signed the opt-out register, 6% of the population. The Health Secretary for England, Jeremy Hunt, says: "The issue here is really we know the vast majority of people are willing for their organs to be used but the vast majority of people are not on the organ donor register. "So it's about how we change that, and so the issue of presumed consent is one of the things we are looking at. "But what we need really is to have much better communication inside families so people know what their family members actually want." The percentage of all families who, if approached after their relative's death, consent to donation has remained stubbornly at 60-65%. It is rare for the family of a registered donor to object, but it is more common when people have not signed up or discussed it with their family. The donor system was radically overhauled in 2008, with the introduction of specialist nurses liaising closely with families. There were 793 deceased donors in 2007, and 10 years later that number had risen 78%, to 1,413. Meanwhile, the number of registered donors has risen 67%, from 14.1 million to 23.6 million. But the 2008 taskforce rejected the ides of presumed consent. "And if the answer is yes, then that would be very good. But if the answer is no, then I question why we are going down this route. "The only evidence I have seen is that it won't make any difference and it is not the answer to the problem, but there is a risk that it may make things worse. "That is my starting point. I am not totally against it, but if I am right, it won't improve things. "There is no good evidence it will increase the number of donors." But Dr Afshin Tavakoli, a transplant surgeon at one of the UK's busiest units at the Manchester Royal Infirmary, says it's not the issue of presumed consent that matters most. "It is very important that people talk about their wishes to members of their family, to their children, to their parents. "The time can come at any time, for any one of us, and and at that moment our wishes need to be known. "Members of the family have to respect that and they can only do so if they really know what we want."